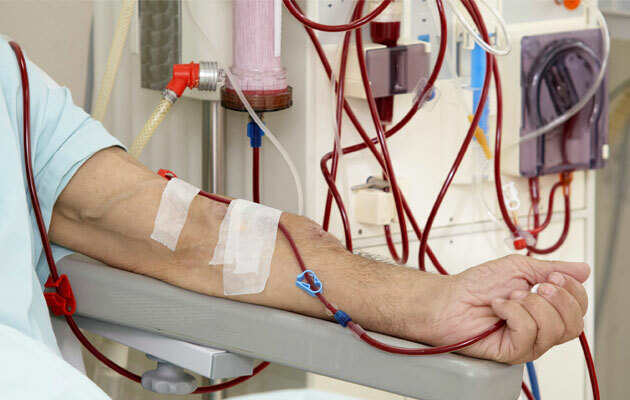 CAPD stands for Continuous Ambulatory Peritoneal Dialysis, because it happens throughout the day, at home or at work, while the person goes about his or her daily life. During CAPD, a bag of dialysis fluid is drained into the peritoneal cavity through a Tenckhoff Catheter. The fluid is left in the body for 4 to 6 hours, while it absorbs the waste products from the blood, through the Peritoneum. The fluid is then drained out. This procedure is called an exchange – it takes 20 to 30 minutes to perform and needs to be done 4 times a day. During the 4 to 6 hours between exchanges the bag is disconnected leaving you with only a capped-off, short, rubber tube. You will receive thorough training in bag changing and sterile techniques. The time it takes to learn varies from one person to another, but the average time is a week to 10 days. CAPD is a simple and flexible treatment and the procedure is not difficult to learn. It will soon become part of your everyday routine. Once you are established on CAPD, you will continue to attend your Unit for regular outpatient appointments. It will be important for you to keep daily records of your treatment in a book that will be provided and to take this book with you when you go to the Unit.